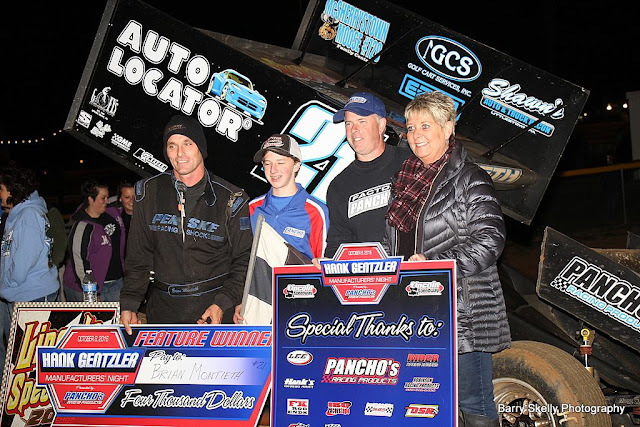 ABBOTTSTOWN, PA 10/9/2016 – Brian Montieth took advantage of a front-row starting position to score the 53rd win of his Lincoln career in Sunday night’s Hank Gentzler Memorial Manufacturers Appreciation Race sponsored by Pancho’s Racing Products. Montieth grabbed the lead from polesitter Austin Hogue at the outset and led every lap. Dietrich, who started sixth, was already up to second by the end of the second lap, setting up the anticipated race-long battle between the two dominant racers at the Pigeon Hills oval in 2016. The only break in action during the 25-lap event was a sixth-lap caution for Bill Jones, Jr., who came to a stop in turn one. Dietrich chased Montieth the whole way, pulling alongside the leader several times over the second half of the race. 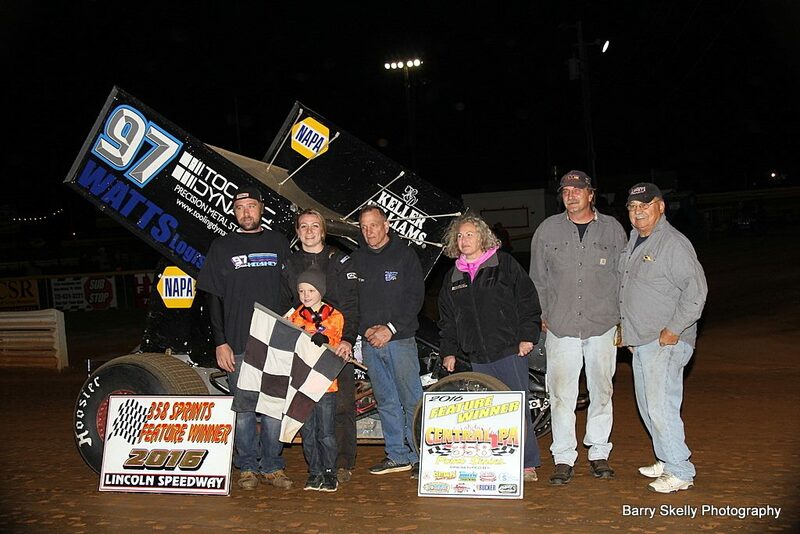 Montieth’s final margin of victory was a carlength, with Alan Krimes making a late-race pass over Lucas Wolfe to finish third. Wolfe and World of Outlaw invader Jacob Allen crossed fourth and fifth. Sixth through tenth were Brent Marks, Jim Siegel, Greg Hodnett, Logan Schuhart, and Hogue. Heats for the 29 410 sprints on hand were won by Wolfe, Siegel, and Hogue, with Brandon Rahmer winning the consolation. Lady driver Brie Hershey won a race-long battle with Brent Shearer and survived a last-lap shootout to score her second win of the year in the 20-lap “358” sprint car feature. Like Montieth, Hershey started on the outside of the front row alongside Jake Eldreth. But unlike Montieth, she did not lead every lap. She momentarily lost the lead to Shearer, who was scored the leader in heavy lapped traffic on lap 10. But Hershey made the bottom groove work to perfection and got back around Shearer on lap 11. She joined Doug Hammaker and Jeff Rohrbaugh as the only repeat winners in the 358 division this season. Shearer settled for second, with 11th-starting Doug Hammaker, 2016 track champ Chandler Leiby, and 12th-starting Tyler Esh rounding out the top five. Sixth through tenth were Eldreth, Todd Rittenhouse, Jr., Ashley Cappetta, 19th-starting Kyle Denmyer, and Cody Fletcher. Heats for the 28 358 sprints on hand were won by Dwight Leppo (who flipped on lap 19 of the feature), Shearer, and CJ Tracy, with Kyle Denmyer winning the consolation. Fred Cullum won again in the All-American Outlaw feature, remaining undefeated at Lincoln in 2016. And he did it in dramatic fashion, catching race-long leader Bryan Green coming down to the checkered flag on the last lap. For the second straight time, Green lost to Cullum on the final turns to the checkered. Third through fifth were Justin Cullum, Randy Doty, and Danny Holmes. Heats for the All American Outlaws were won by Green and Fred Cullum. The All-American Outlaw feature ended the 2016 Lincoln racing season. The Lincoln Speedway Awards Banquet will close out 2016 speedway activities on Saturday, November 19th (6 PM-12:30 AM). Promoters Don Leiby and Alan Kreitzer have announced that opening day for the 2017 season will be Saturday, February 25th. Gates will open at noon with 410 sprint car racing to begin at 2:00 p.m.